My cousin and his wife have two little girls, one just turned two, and the other is just under three months old. Though they're both cute as buttons, what I find amazing is the sheer amount of technology that goes into children's products. 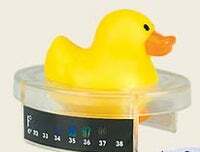 Take, for example, this $6.99 Rubber Duck Thermometer that I saw in their bathroom. Ducks are amazing: they guard our homes, clean our keyboards, and now ensure that our baby's bath water is at a pleasantly warm (but not hot!) temperature. In addition to that, they provide hours of bathtime fun! What can't ducks do?